Brompton put out a tweet today asking people to come up with some tips for the Brompton World Championships. I along with many others offered my suggestions and some were even retweeted by Brompton. It did get me thinking about putting together a little guide for the discerning, gentleman rider. There are many types of blazer/jackets out there. Sadly, the bespoke, tailor made are a rare sight. If your blazer or jacket is off the peg, do not worry. Follow these simple steps. I must state that I am referring to single breasted blazers/jackets. (If you have a double-breasted type, I suggest you seek advice elsewhere). For a two button blazer/jacket, the top button is all that is needed to be fastened. If both are done up you run the risk of being labelled at best a cad. For three button blazer/jacket the middle button should be fastened. If all three are done up people may tut. 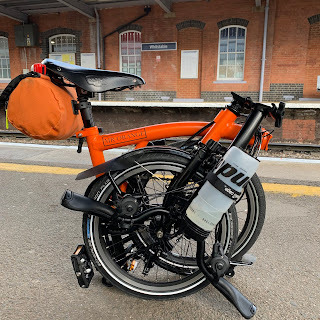 Brompton allows riders to run to their folded bikes. A gentleman does not run! The only times a gentleman is permitted to run is in a time of war or if he is late for his wedding. I will not be running. Let's be blunt about this. Unless you are semi-professional, you will be overtaken. This may induce one to let fly a profanity. This is not the conduct of a gentleman! If you must say anything at all you might want to consider the following, which should be said under ones breath. "If that doesn't take the giddy biscuit!" With modern fashions as they are there has been a move towards not shaving and cultivating stubble. I suggest that gentleman rider shave before departing. This will have two benefits. First, the absence of stubble will increase aerodynamic efficiency. Second, it will ensure people do not mistake you as being a member of the criminal classes. Your beloved Brompton does need as much attention as you can give. Tyres need to be inflated to the correct pressures. The chain would benefit from some oil and generally you need to give things the once over. Of course the gentleman rider will leave this to someone else, as I have done. As you travel around the course whether it be the Marathon, the Brompton World Championships itself or the Sprint, remember that a sense of fair play and abiding by the rules is a must. So, don't stray into the middle of the course just for the sake of it as you may be mistaken for a cad and bounder. Keep to the left. Before reading further I must warn you that the following advice may cause a great deal of upset. Please steel yourself for the worst. Right, if you are still reading the shirt is a very important item. As the gentleman rider will almost certainly get hot, it would be better to wear a short sleeved shirt. A short sleeved shirt is not really something a gentleman would wear in this country and at best would only be acceptable if visiting the tropics, however for the Brompton World Championships it is perfectly acceptable. It will keep the gentleman rider cooler, which can only be a good thing. The tie is a very important item indeed. Old school ties, sporting clubs, University etc.., are all acceptable as are ties that are colour coordinated to the colour of ones Brompton. Under no circumstances wear a bow tie unless you possess a Ph.D., in Geography. Word to your mother, blood! This really will not do for the discerning gentleman rider. A shaking of the hand is traditional but a simple greeting of, 'what ho!' will cover all social interactions. The night before the Brompton World Championships try and eat some pasta and drink plenty of water. On the big day have porridge or a couple of poached eggs and again drink plenty of water. On route have a banana and continue to drink water. By doing this you will not be like the sickly child with a note from Matron, sitting on the sidelines. Arrive for your chosen event in good time so that you are not late, panic and feel the need to run. (Please see above). If you follow these easy and simple steps, you will have a fantastic Brompton World Championships. See you on Sunday! Re: Grooming/Shaving, please emphasise that a gentleman is not required to shave his legs to aid streamlining. This guideline does not apply to ladies. I would suggest that gentlemen do not shave their legs unless a professional cyclist. Ladies may do as they please but for some ladies my advice stands. I write in response to your comments on bow tie attire. Doth sir agree to one sporting a spinning bow tie? I only ask as it's merits are surely of interest to BWC competitors – Thus acting as a cooling device, an audible warning for fellow competitors you are on a charge and not least a nod to the great Spitfires of old bravely going into battle…see you Sunday, with or without the aforementioned…I do have a GCSE in Geography! What ho surely. You put a good case forward for a bow tie and I can see your particular versions merits. However, you only have a GCSE in Geography and a spinning bow tie might give onlookers the impressions that you are an employee of Billy Smarts circus. I leave you to decide if you can cope with this stigma. Very nice list of the "right" things to do for the race. Wish you the very best luck in the championships! Thank you Chandra. You are exempt from the shaving part. We go back a long way. Good luck at the BWC! Many thanks Fernando. Look out for the blog in the few days after the race. I note you are hoping to help the fledgling entrant and commend you for your efforts. Several points, if you don't mind. Moustaches, to be waxed at all times (-comment addressed to gentlemen). Treating foreigners as fellow entrants. Some have come from far away and are not familiar with our local customs. We trust you will show them our best sporting behaviour and not dip into your Italian phrase book hoping for choice profanity. Shirts- put aside short things and be a man! Have your man contact your tailor and ask for a shirt with larger collar and cuffs. This provides ample venilation and avoids stooping to the foreigners idea of normal attire.